Ever found yourself wondering “what is the cloud”? Like cloud software, machine learning is intangible, complex and a radical departure from the status quo. Yet, despite our eyes glazing over each time someone tries to explain it, we revel in its magic and the hours of time and frustration it saves us. Machine learning is a type of artificial intelligence that enables computers to find and act on hidden insights without the need for a human. It’s prevalent in almost every facet of our lives. We expect Netflix to recommend our next favourite show, and we rely on Facebook to find long lost friends. But, let’s go beyond the couch and picture how machine learning could improve your business. Imagine being able to predict grass growth based on the weather, or spotting a cow more at risk of getting sick. Perhaps a company car that corrects course before a crash, or a programme that drops the time it takes to read a legal case to a matter of seconds. Machine learning has the power to do so much more than automate data entry. Here at Xero, we’re harnessing your business information to address one of your biggest pain points, picking then entering the right account codes for your invoices and bills. We want to soak up the monotony, and add a little Xero magic, so you can get back to the things that really matter! Cue Xero’s first machine learning project, which set the course on our journey towards code-free accounting. We tasked invisible robots with learning how you do business. Then we produced a mathematical model that replicated your invoice coding behaviours, even correcting default answers and mistakes along the way. We tinkered, iterated and learned a bunch during this project. Finally we magicked-up a similar solution for entering your supplier bills, which is a highly-used feature in Xero and prone to human error. Over 500,0000 bills are entered into Xero every day and more than half of businesses are using at least 10 different expense codes. Accounting codes are a necessary evil, so you’re faced with two options. Firstly you could edit each bill line as you go, or you could individually create and save a default code against different suppliers or bill items. Both are frustratingly fiddly so, in a quest to speed things up, mistakes often get made or expenses are grouped too broadly. This makes it hard to monitor and understand expenditure down the track. For bills, Xero now creates a learning model derived from your own chart of accounts and bill history. In essence, you have a personal robot dedicated to predicting codes based on bills you’ve previously entered, codes already saved against your contacts, or how your accountant has fixed similar bills. Once you’ve entered more than 150 bills, your robot pre-populates a suggestion for every bill line. Voila, you don’t have to think! Now the trick with machine learning is that the more information you enter, the more accurate Xero becomes. Consequently we have to expect a few hiccups while the robots get accustomed to the bespoke ways we each do business. If you don’t enter many bills, or those you do are wildly different, it may take a little longer to get up to speed. Think about training a new employee. They’ll have lots of questions, take a bit more time and make a few mistakes along the way. But, as they learn what to expect and how to react, they speed up and the job becomes second nature. Machine learning is much the same, the robots thrive on data and the more they get, the better they become. We’re blazing the trail for accounting automation because we take your time, business and Xero experience seriously. We also want to be upfront about how machine learning works and the initial inaccuracies you might experience. 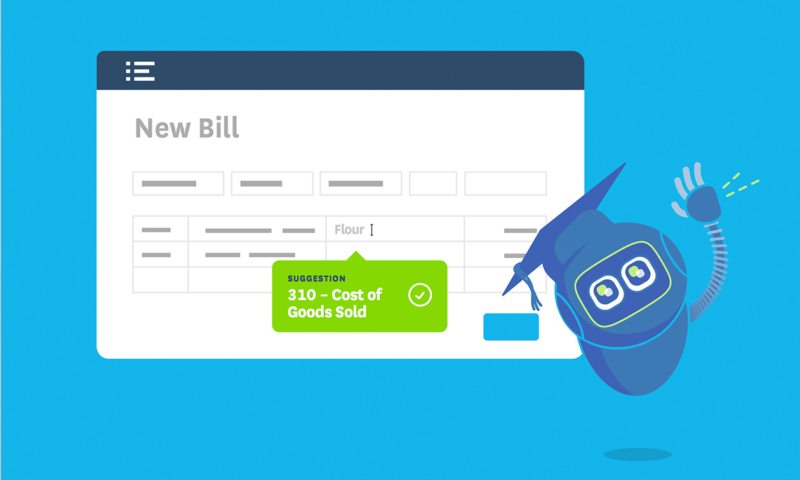 For supplier bills, the accuracy of Xero suggestions is around 70 – 75%. However, given the variety of bills coming through each month, this will vary from business to business. If you’re feeling a bit underwhelmed the first few times, stick with it, accuracy dramatically improves the more bills you enter. If we all work together, accepting good suggestions and correcting mistakes, our personal robots will be flying ahead in no time, coding accounts much better than any of us can. So get stuck into this game-changing technology and embrace the learning phase. Your future self will thank you! Keen to learn more? Check out the help page for extra detail. Really excited for this feature, what a time saver. Thanks Xero! Not impresed! Please make this feature optionsl – I do not like to be second guessed by a machine! Looking forward to seeing this in action. Does it work in the draft area as well? It sure does. Provided you’ve entered at least 150 bills previously, suggestions kick in before you save an invoice. If you’ve saved a draft, you can go back into the draft, add another line and you’ll get a suggestion for the new line. Hope that heaps!